Follow NBA games live or in your own time. 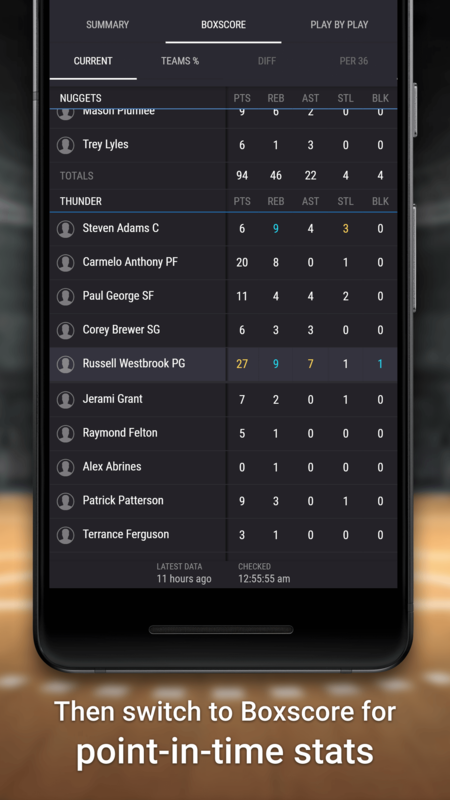 With Spoiler Free NBA Scores, you’re in control of which results and stats you want to see. Any NBA stat head need this! 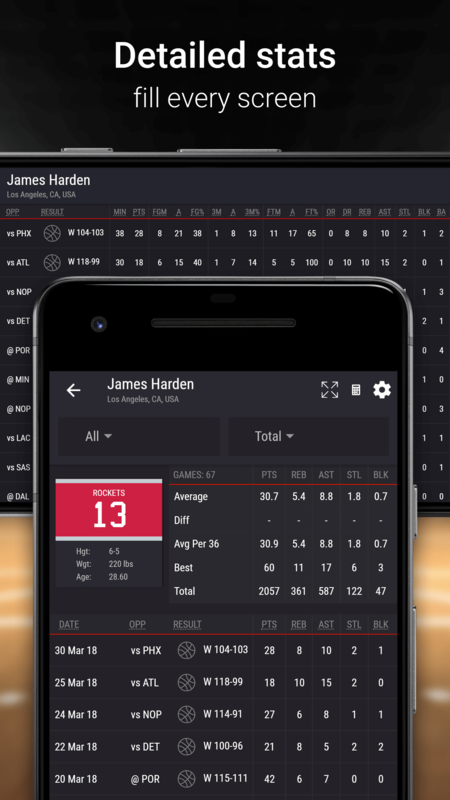 By far the best NBA app for stats and scores. Wish all sports had this to be honest. 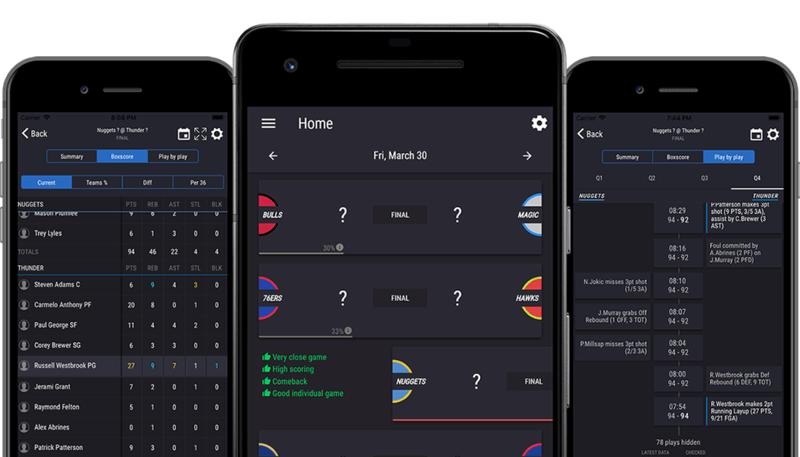 This app is great for fantasy sports as the highlighting makes it easy when reviewing game logs, off line access, and the studs, surprise studs, and surprise duds are a nice touch. Absolutely love this app! Love this app. Gets all the stat I want quick compared to other basketball apps. Very in depth. Bought a pro version to support development. In future add pictures of players if you can. Good work though. Great for fantasy sports fans! Cool app does exactly what it should do. Easy to use interface and great to keep up to date with sports teams and individual players. Can’t catch an NBA game live, but don’t want the result ruined? Spoiler Free Basketball helps you decide which NBA games you want to watch without spoilers. The app gives each game a watchability rating with reasons to watch or not. Because you can turn scores on and off for individual games, you can explore some games now while saving others for later. Not sure if a game is worth watching? Explore it quickly in Play by Play, then pick up the game when it starts getting interesting. The feeling of a live game in your own time. 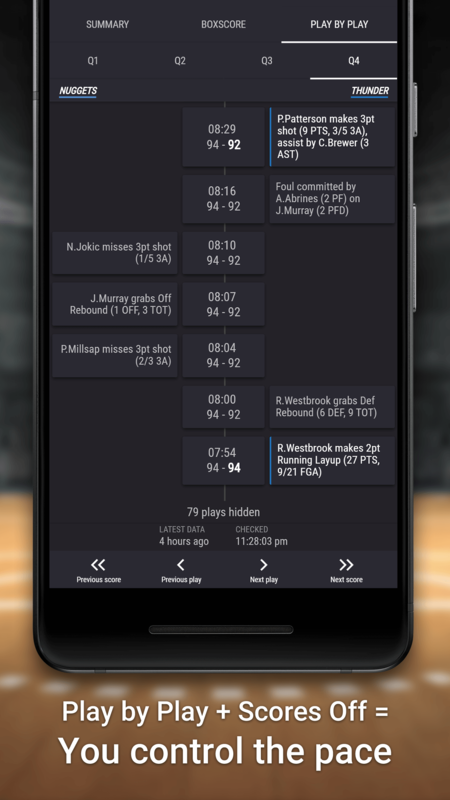 In Play by Play mode, you can step through each play and view stats, tallies and the boxscore at that point in time. This is great for following along if you’re watching a game in your own time. Spoiler Free Basketball has all the stats features you’d expect, plus a few unique ones. Who were the best and worst performers of the day? Find out from Studs and Duds. 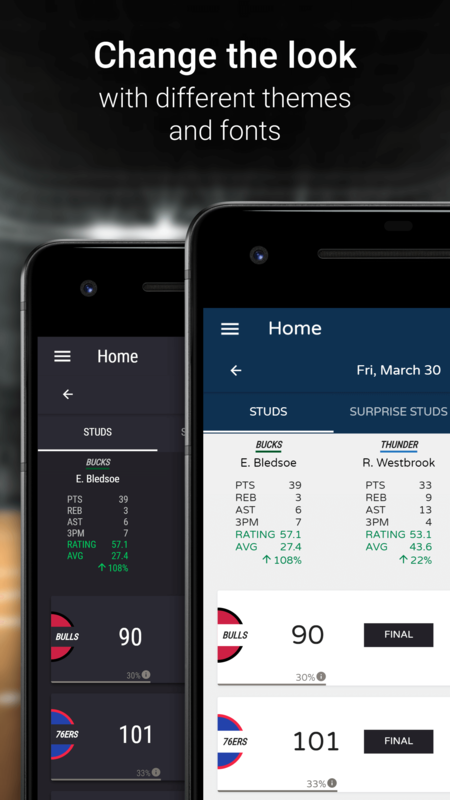 Go beyond the usual stats with our Boxscore — see a player’s stats as well as the difference compared to their normal average and the percentage they’ve contributed to the team. Also, Team High and Game High stats are always highlighted. Explore stats like never before. Spoiler Free Basketball makes it easy to explore the stats for yourself. Is your player having a slump or a hot streak? Define your own player trends with the unique Summary calculator — great for fantasy basketball. League rankings show where your player sits in context for any stat. See your team’s streaks at a glance with colour-coded wins and losses. Use the Leaderboard filters to explore different combinations of any stat with age, weight and height — for example, who’s scoring the most points aged under 21? You can even look into the future with the On Track feature, which shows where players would end up at the end of the season if they continue at their current pace, also in the context of the all-time records. Change the look and feel to suit you. Spoiler Free Basketball comes with a dark and light theme. There’s also a range of fonts to choose from, with a mix of serif and sans-serif and different characteristics. This app does not collect, store, use or disclose any personal information. However, it does use Google AdMob to serve ads. AdMob uses your device's dedicated advertising ID (made available by the Android and iOS operating systems) to serve personalised ads based on your interests (which includes collecting and analysing user data). Find out more about how Google uses this information, and how to control it.